The World’s Best Jockey will be making an appearance in the land of the Big Banana during Coffs Harbour’s Cup Carnival this week. Ace rider Hugh Bowman has already been snapped up to partner Warwick Farm-trained galloper Pelethronius in Thursday’s $80,000 Carlton Draught Coffs Harbour Cup (1600m). “I am extremely happy for Hugh to be riding my horse; he has an excellent chance of winning,” quipped trainer David Pfieffer. Pelethronius started favourite in last year’s Cup but after giving away a long start, found it beyond him finishing sixth to Darci’s Affair carrying the steadier of 61.5kg. Previously, the five-year-old had won four successive races at Kembla Grange, Warwick Farm and Royal Randwick (twice). The gelding has had a couple of runs in town since a two-month break and according to his trainer, will be cherry ripe for Thursday’s Cup. Pfieffer is taking two other gallopers to Coffs Harbour: Brix and Lieutenant Dan with the pair to be ridden by Matthew McGillivray. Brix has only raced three times for two thirds and his last start minor placing at Scone was a top performance. Lieutenant Dan has had excuses for his past two runs, the latest when sixth to Emperor Harada at Gosford. The gelding missed the start by several lengths and with the front-runners going slow, was given an insurmountable task to win. 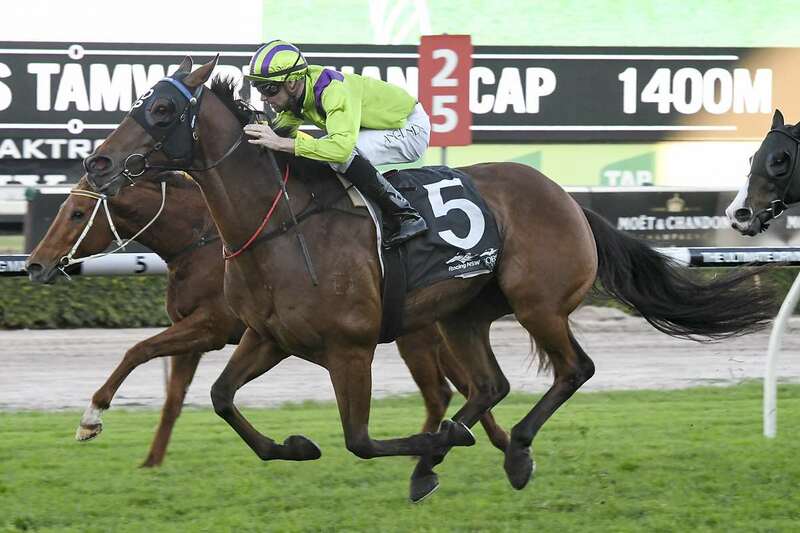 “He is going much better than his form reads and should relish the softish track at Coffs Harbour. “We’re taking the three up to Coffs – we took two up last year and although we missed out with Pelethronius in the Cup, we had Refuge Bay win the Class 3 Handicap, so the trip turned out OK.
CHRC received 38 nominations for the Cup including last year’s winner Darci’s Affair (with Robert Thompson to ride again), Bodegra Negra who won the rain-delayed Cup in 2016, last start Warwick Farm winner Curragh and South Grafton Cup winner Cogliere. Leading Newcastle trainer Kris Lees has nominated Feelin the Love and Olympic Academy, while Kembla Grange trainer Michael Tubman will be making the seven-hour trek with Dashley Dubh (Cup) and Old Man Sam in the other feature, the $40,000 Coffs Harbour Toyota Daniel Baker Showcase Sprint (1200m). Other jockeys heading up to Coffs include Grant Buckley, Winona Costin, Andrew Adkins and Andrew Gibbons. “We will be celebrating our 10th Park Beach Plaza Fashions on the Field with a huge prize pool being offered again,” said CHRC’s manager, Tim Saladine. “And tickets are still available in our Lawn Party and our Jag/Landrover VIP Party.